Where do I Start my Trip? Our boats operate from Colt Hill on the Basingstoke Canal at Odiham in Hampshire. Or get DIRECTIONS FROM GOOGLE MAPS. 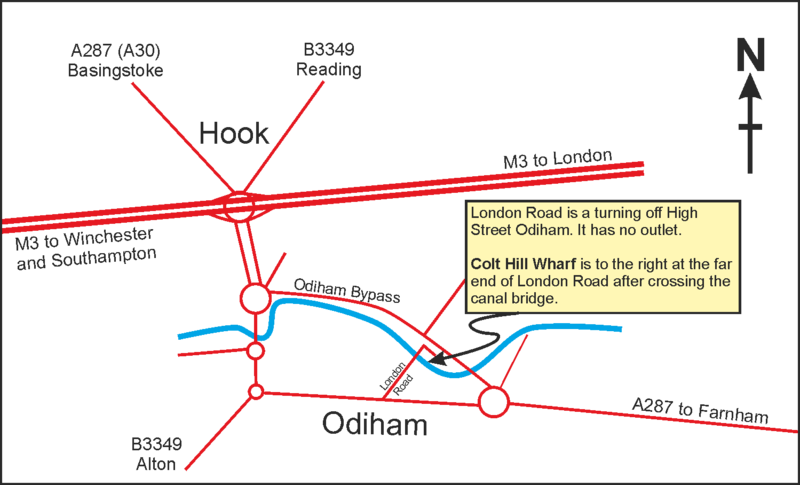 Those with satnav can use RG29 1AL to get close to Colt Hill. The right turn into the canal car park is at 51°15'36.5"N 0°55'50.8"W (51.260127, -0.930786). Those taking a trip on Dawn should proceed directly to the wharf area. Hirers of Madam Butterfly should go initially for a briefing at Galleon Marine boatyard and to arrange access to the wharf. 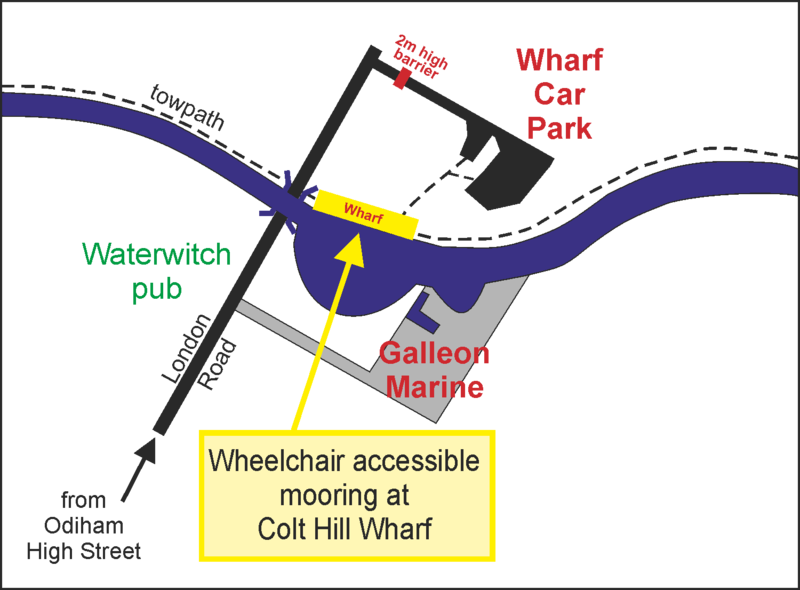 Secure overnight parking is available at Galleon Marine for those on multi-day cruises. Boarding of both boats is at the the wharf and, on request, vehicles can be driven onto the wharf to facilitate loading and unloading of passengers and luggage. Note that there is a 2-metre barrier at the entrance to the wharf area and adjacent car park and a locked gate across the track leading to the wharf; both can be opened on request . If barrier opening or wharf access is required for day trips, it is best to make contact with the boat crew before entering the car park area. Either call the crew using the mobile number provided with your final trip instructions, or pause just after the canal bridge and attract the attention of the boat crew on the wharf. All content © Accessible Boating Association 2019.